Santa Barbara Baking Company’s German-style Christmas Stollen was developed and perfected by the German owner of the bakery. This truly one-of-a-kind product is a traditional holiday cake served all over Germany during the long winter holiday. Created in Dresden, Germany around 1450 Stollen is a light airy cake that is quite low in sugar. 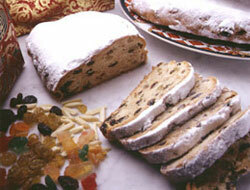 Each Stollen is filled with raisins, almonds, and dried fruits that have been soaked in rum for 24 hours. The generous brushing of butter and snow-sugar powder add to the Stollen's unique taste and appearance. Our Stollen is available November, December, and January. Are you looking for the perfect holiday gift? Send your friends a beautiful German Christmas Stollen! "This Stollen was even better then the ones I know from Germany. What a treat! — Roland B.